We have changed the Arrivals & Departures report within SuperControl to make it more customisable to your needs. 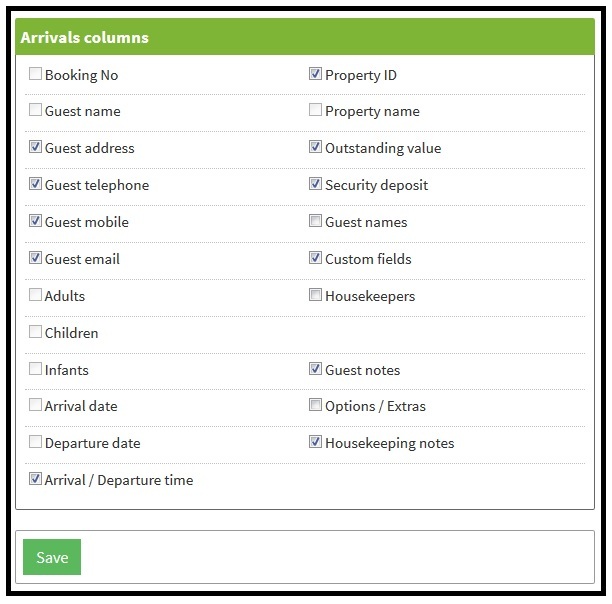 Here, you can filter by the dates you require and select whether you want to view Arrivals, Departures or both. You can also choose to hide or include certain criteria in the report. If you look at the top right-hand corner of the above box, you’ll also see Columns. Simply click on Columns to decide which ones you want to include in your report (the list is as shown below). Please note, some of the fields here cannot be removed as they are required for property and customer identification. Tick the checkbox next to all the columns you wish to include in your report and hit Save. Once you’re done, click Filter to get your report. The report will display on your screen and you will also be able to export it as a PDF or a CSV file. If you choose PDF, bear in mind you will not be able to manipulate the file and, if you select a large number of columns, it won’t print well. In this instance, it would be better to export the report as a CSV file and adjust your settings in Excel before printing. If you have any queries about the changes, please get in touch with our Support team.